Gardening woes | Life's Conundrum - Eat to Live or Live to Eat? I must admit that trying to grow my vegetables without pesticides is a challenge. My home made oil based pesticide does not seem to deter pests. I was upset to see the leaves of my brussel sprouts completely stripped. 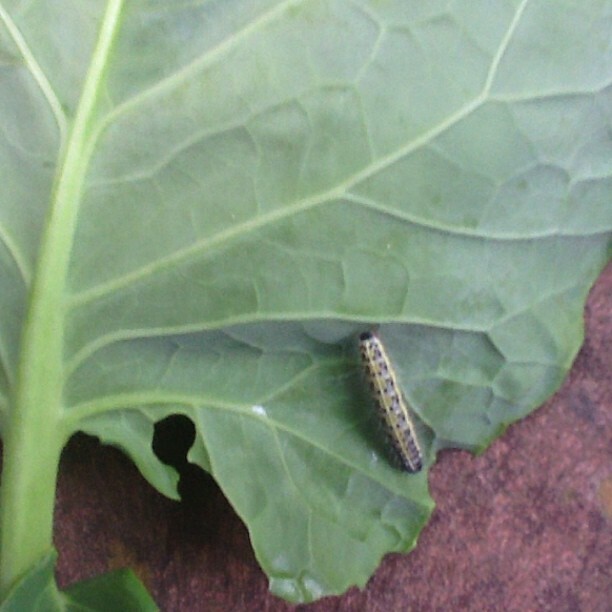 On careful investigation and to my utter horror I saw colonies of caterpillars on the leaves. I tried to remove them manually using forceps but just gave up when I saw the biblical proportion. I do not think I am going to grow brussel sprouts again next year. My beautiful bluish green cabbage leaves have large holes in them and the slugs seem to have taken over every inch of the garden. My squash and pumpkin plants have been afflicted by some sort of black powdery bug which is so sticky and difficult to remove. We have had small victories like a few beautiful cauliflowers and rhubarb chard and baby green tomatoes are looking promising. My initial enthusiasm has almost turned to despair and just hope that I will have some vegetables before winter for the hard work I have put in. Posted on July 10, 2013 by Anna and Shiv	• This entry was posted in Gardening and tagged Brassica, Brussels sprout, Cauliflower, Fruit and Vegetable, Home, Kale, Kitchen garden, Vegetable. Bookmark the permalink.